United Nations special rapporteur on extrajudicial, summary or arbitrary executions Philip Alston has announced that he will formally ask the U.S. to halt its CIA programs of drone warfare. Alston, representing the UN, says that the drones should be operated by the military because the military drone program better complies with international warfare codes and because the military program is more transparent and accountable than the officially secret CIA program. Philip Alston, the United Nations special rapporteur on extrajudicial, summary or arbitrary executions, said Thursday that he would deliver a report on June 3 to the United Nations Human Rights Council in Geneva declaring that the “life and death power” of drones should be entrusted to regular armed forces, not intelligence agencies. He contrasted how the military and the C.I.A. responded to allegations that strikes had killed civilians by mistake. Mr. Alston’s views are not legally binding, and his report will not assert that the operation of combat drones by nonmilitary personnel is a war crime, he said. But the mounting international concern over drones comes as the Obama administration legal team has been quietly struggling over how to justify such counterterrorism efforts while obeying the laws of war. 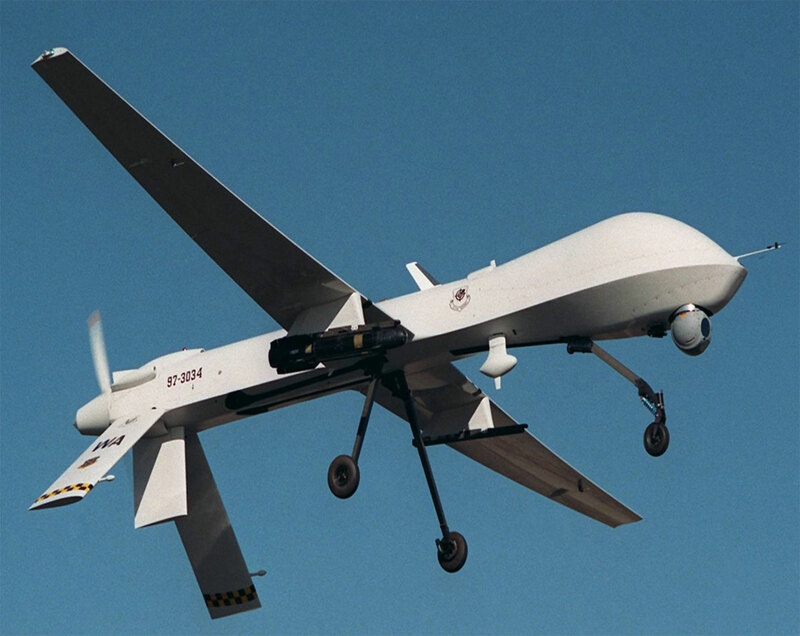 “My concern is that drones/Predators are being operated in a framework which may well violate international humanitarian law and international human rights law,” he said. The use of human rights laws against democracies defending themselves against terrorists is a favorite tactic, and Israel is the usual target. The goal is to tie the hands of civil societies through false moral equivalencies, in which the terrorist trying to kill civilians is equated to the people trying to stop the terrorist. Expect more of this, as the world becomes less enthralled with Obama, and seeks to give him some small measure of the attention given George W. Bush. What goes around comes around, and it will come around for Obama and those in his administration who were so quick to accuse Bush and Cheney and Rumsfeld of violating international and domestic law as they struggled to find a means of stopping al-Qaeda. The appeal of drone attacks for policy makers is clear. For one thing, their effects are measurable. Military commanders and intelligence officials point out that drone attacks have disrupted terrorist networks in Pakistan, killing key leaders and hampering operations. Drone attacks create a sense of insecurity among militants and constrain their interactions with suspected informers. And, because they kill remotely, drone strikes avoid American casualties. But on balance, the costs outweigh these benefits for three reasons. First, the drone war has created a siege mentality among Pakistani civilians. This is similar to what happened in Somalia in 2005 and 2006, when similar strikes were employed against the forces of the Union of Islamic Courts. While the strikes did kill individual militants who were the targets, public anger over the American show of force solidified the power of extremists. The Islamists’ popularity rose and the group became more extreme, leading eventually to a messy Ethiopian military intervention, the rise of a new regional insurgency and an increase in offshore piracy. While violent extremists may be unpopular, for a frightened population they seem less ominous than a faceless enemy that wages war from afar and often kills more civilians than militants. Press reports suggest that over the last three years drone strikes have killed about 14 terrorist leaders. But, according to Pakistani sources, they have also killed some 700 civilians. This is 50 civilians for every militant killed, a hit rate of 2 percent — hardly “precision.” American officials vehemently dispute these figures, and it is likely that more militants and fewer civilians have been killed than is reported by the press in Pakistan. Nevertheless, every one of these dead noncombatants represents an alienated family, a new desire for revenge, and more recruits for a militant movement that has grown exponentially even as drone strikes have increased. Second, public outrage at the strikes is hardly limited to the region in which they take place — areas of northwestern Pakistan where ethnic Pashtuns predominate. Rather, the strikes are now exciting visceral opposition across a broad spectrum of Pakistani opinion in Punjab and Sindh, the nation’s two most populous provinces. Covered extensively by the news media, drone attacks are popularly believed to have caused even more civilian casualties than is actually the case. The persistence of these attacks on Pakistani territory offends people’s deepest sensibilities, alienates them from their government, and contributes to Pakistan’s instability. The anti-drone argument goes like this: Because drone attacks kill innocent civilians and violate Pakistan’s sovereignty, they are deeply and universally despised by Pakistanis, and contribute to deepening anti-U.S. sentiment in the country — enmity that could boost terrorist organizations’ recruitment and eventually force Pakistan’s military and civilian leaders to abandon their cooperation with the United States. During his testimony before the U.S. Senate Foreign Relations Committee in May 2009, David Kilcullen, a former counterinsurgency advisor to Centcom commander Gen. David Petraeus, said it was time for the United States to “call off the drones.” Later that month, Kilcullen and Andrew M. Exum, who served as an Army Ranger in Iraq and Afghanistan from 2002 to 2004, published a provocative editorial in the New York Times, titled “Death From Above: Outrage from Below,” in which they estimated that over the “past three years” drones had killed just 14 “terrorist leaders” at the price of some 700 civilian lives. “This is 50 civilians for every militant killed,” they wrote, “a hit rate of 2 percent.” Their conclusion? Drone strikes produce more terrorists than they eliminate-an assertion that has become an article of faith among drone-strike opponents. It would be a damning argument — if the data weren’t simply bogus. The only publicly available civilian casualty figures for drone strikes in Pakistan come from their targets: the Pakistani Taliban, which report the alleged numbers to the Pakistani press, which dutifully publishes the fiction. No one has independently verified the Taliban’s reports — journalists cannot travel to FATA to confirm the deaths, and the CIA will not even acknowledge the drone program exists, much less discuss its results. But high-level Pakistani officials have conceded to me that very few civilians have been killed by drones and their innocence is often debatable. U.S. officials who are knowledgeable of the program report similar findings. In fact, since January 1 there has not been one confirmed civilian casualty from drone strikes in FATA. Not only do drone opponents rely upon these fictitious reports of civilian casualties, they also tend to conflate drone strikes in Pakistan with air strikes in Afghanistan, lumping the two related but very different battlefields together as one contiguous theater. They also conflate different kinds of air strikes within Afghanistan. These distinctions matter, a lot. In Afghanistan, it is an ignominious truth that hundreds of civilians are killed in NATO airstrikes every year. But most of the civilian casualties in Afghanistan have not stemmed from pre-planned, intelligence-led attacks; rather, civilians are most likely to die when troops come into contact with the enemy and subsequently request air support. This is because when it comes to air strikes, NATO forces in Afghanistan have a limited range of air assets at their disposal. As a result, when troops come into contact with insurgents and call for air support, they get the ordinance that is available, not the firepower that would be best suited to their needs. Sometimes large bombs are dropped when smaller ones would have been better, and the risk of civilian casualties increases accordingly. Chris: I do not care how many civilians drone strikes actually kill. And I do not care how many civilians Americans think drone strikes in Pakistan kill. I care only about how many civilians Pakistanis think drone strikes kill. As one of the world’s experts on Pakistani public opinion, you should be able to provide that number to me, right? Because all you can tell me right now is the Pakistani press is dutifully reporting whatever the Taliban tells them … and I already know that. I don’t care in the slightest about what Pakistani generals or the CIA is telling you behind closed doors. It does not matter. I care about what those Pakistani generals are telling their public. I care, in other words, less about reality as defined by verifiable facts and figures and more about reality as it is interpreted in Pakistan and within Pakistani diaspora communities. Honestly, I have been making this point over and over again for a year now. But the only thing the CIA and other agencies and departments have done since then is to have stepped up their information operations campaign aimed at U.S. public opinion — i.e. to have convinced Americans that drones are a good idea. But who cares, honestly, whether or not the Americans who read http://www.foreignpolicy.com know how many civilians die in drone attacks or think drones are a good idea? I certainly don’t. I care more about the people who stand to be most easily radicalized by the strikes. C’mon, dude, get out there, do some polling, crunch some numbers, and then come tell me I’m wrong. Until then, stop telling me what I and everyone else in America already knows. But a forthcoming study, led by Brian Glyn Williams, an associate professor at the University of Massachusetts, finds that the civilian death toll from the drones is lower than most media accounts present. “We came to the conclusion that the drones have a unique capability for targeting militants, as opposed to civilians,” Williams said in an interview. Williams’ study, which he provided to The Washington Independent, has yet to be published. A writer for a blog affiliated with the International Herald Tribune, Farhat Taj, blogged some of the key details of his research today, but prematurely stated that the Combatting Terrorism Center at West Point will be publishing Williams’ work. Erich Marquardt, the editor of the center’s journal, said that he hasn’t even begun to review Williams’ submission yet. Williams insists that he went into the study with an open mind. “We didn’t know what to think” about the drone program, he said, and he considers his research agnostic on the wisdom of the drone strikes (to say nothing of their legality). “We’re not necessarily trying to alter policy on this,” he said. Both of the principle authors of New America’s drone strike survey, Peter Bergen and Katherine Tiedemann, are on vacation, but they both still (generously) addressed my questions. All three researchers — Bergen, Tiedemann and Williams — appeared to agree that New America was more methodologically aggressive than Williams in counting as civilians all who could not be clearly identified as militants, which perhaps accounts for the variance in their results. Accordingly, Bergen now pegs the civilian death rate from the drone strikes at 20 percent. Williams pegs it at 3.53 percent. What no one knows, however, is how many outraged Pakistanis take up arms against the U.S. or its allies as a result. The American military on Saturday released a scathing report on the deaths of 23 Afghan civilians, saying that “inaccurate and unprofessional” reporting by a team of Predator drone operators helped lead to an airstrike this year on a group of innocent men, women and children. The report said that four American officers, including a brigade and battalion commander, had been reprimanded, and that two junior officers had also been disciplined. Gen. Stanley A. McChrystal, who apologized to President Hamid Karzai after the attack, announced a series of training measures intended to reduce the chances of similar events. The episode, in which three vehicles were attacked and destroyed in February, illustrated the extraordinary sensitivity to the inadvertent killing of noncombatants by NATO forces. Since taking command here last June, General McChrystal has made the protection of Afghan civilians a priority, and he has sharply restricted the use of airstrikes. The overwhelming majority of civilian deaths in Afghanistan are caused by insurgents, but the growing intensity of the fighting, and the big push by American and NATO forces, has sent civilian casualties to their highest levels since 2001. Obviously killing civilians is horrible, as well as strategically counterproductive, and killing civilians by the dozens is just awful stuff. But the relevant authorities do seem to me to be quite earnest and at least somewhat successful in their determination to mitigate the extent to which these things happen. The problematic aspect of the drone attacks that I haven’t seen discussed as much as it deserves is really on the Pakistan side of the border and concerns the National Security Strategy’s stated aspiration to create a rules-based global order. Simply put, having the CIA conduct a secret undeclared de facto war in Pakistan is kind of the reverse of rules-based activity. There’s a colorable rationale under existing rules for unilateral military action in Pakistan under the UN Charter’s absolute recognition of a right to individual and collective self-defense. But this isn’t military action, it’s CIA action. And by definition covert use of force is not rules-based. Now I think you could fairly say that a world of “liberty under law” is a regulative ideal rather than an actual reality, so it’s not per se a violation of the relevant principle to engage in activities outside the rules. Simply pretending that an airtight rules-based global order exists doesn’t make it so. At the same time, to say “the rules-based global order is an aspiration rather than a reality, therefore we can operate outside the rules whenever it’s convenient” actually makes a mockery of the aspiration. And the covert actions in question are some of the worst-kept secrets in the world. So I think there’s a real problem here that’s worthy of more critical thinking. Ultimately the United States is judged more by what actually happens than by what policy documents say, and I think it’s important to do more to align what we’re actually doing in this regard with our big-picture policy aims. Speaking just in terms of using drones as attack weapons here, I would argue the important issue here is not whether we use drones. The issues are a) whether it is right to use any weapon in such a manner as to risk more casualties among civilians than we are willing to accept among our own troops (as both manned and unmanned forms of aerial bombing do) b) whether we are willing to use any weapon to summarily execute individuals we have associated with criminal organizations whether or not they are engaged in what might be considered combat operations against us and c) whether it is either right or effective to outsource the deployment of lethal violence – by drones or by other means – from our military to our civilian agencies? One of last Friday’s big stories somewhat lost in the hustle and focus on the BP Gulf oil disaster and the holiday weekend concerned the continuing outrage of the US drone targeted assassination program. Specifically, Charlie Savage’s report at the New York Times that the United Nations Special Rapporteur on Extrajudicial, Summary or Arbitrary Executions, Philip Alston, was expected to issue a report calling on the United States to stop Central Intelligence Agency drone strikes thus “complicating the Obama administration’s growing reliance on that tactic in Pakistan”. A senior United Nations official said on Wednesday that the growing use of armed drones by the United States to kill terrorism suspects is undermining global constraints on the use of military force. He warned that the American example will lead to a chaotic world as the new weapons technology inevitably spreads. In a 29-page report to the United Nations Human Rights Council, the official, Philip Alston,the United Nations Special Rapporteur on extrajudicial executions, called on the United States to exercise greater restraint in its use of drones in places like Pakistan and Yemen, outside the war zones in Afghanistan and Iraq. The report — the most extensive effort by the United Nations to grapple with the legal implications of armed drones — also proposed a summit of “key military powers” to clarify legal limits on such killings. Here is Alson’s official report.